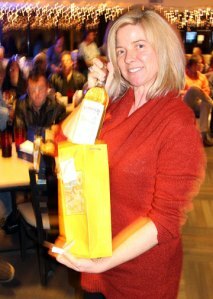 Liquor once again proved to be the hot item at the Buccaneer Gift Exchange Tuesday night, December 13. 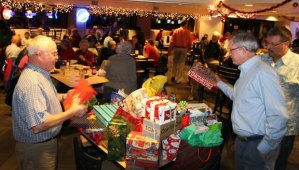 With an excellent turnout and a heaping table of gifts, the social decibel level was at max most of the night. 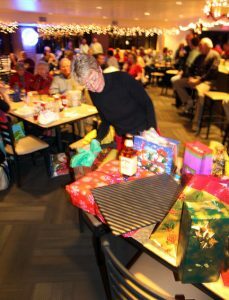 Two “thefts” of open presents was the rule and while the thievery began slowly, it was still rippling through the crowd as the evening ended—mostly bottles of spirits changing hands. Pat Favier managed what was probably the night’s heaviest thievery traffic, owing to her ability to spot the hot presents on the table, including two bottles of Bailey’s Irish Cream. Other top picks to pick: A classic boat lantern and a model sailboat. 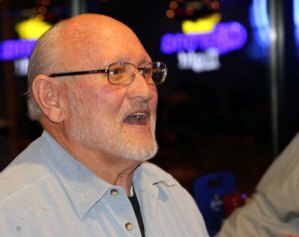 Mike Parker also guided the group through the semi-annual Ye Blunder Bucket voting, “won” by Ray Gazzera. Rob Gibbs waved photo evidence of Ray’s Blunder: His Catalina 22 sitting bow up, stern down, still on its trailer, when Ray failed to secure the trailer hitch. Ray is a Blunder Bucket nominee many times over, but this is his first actual “victory.” In fact, Ray had been nominated so many times that in 2007 we awarded him an honorary “Life Achievement” Blunder Bucket. Gene Walentiny nominates Bob Worrall for a Blunder Bucket. Bob nominates him back. Lots of excellent presents for the annual party. Katherine Motil checks out the choices.